Once you have decided on the property and the week(s) you desire - BOOK IT! To book through the website, click the "Instant Quote & Reserve it Now" buttons on the right-hand side of the property listing and follow the options and payment prompts. Online reservations are available to book 24/7. Once you book online we will confirm the booking during business hours. You may also choose to book over the phone. Please remember, bookings are first come - first serve. To "book" your desired rental property with us, if there are more than 30 days until the rental start date, we'll require a 50% deposit of the total rental amount which includes tax and fees. You can pay this by credit card, check, cash, or money order. We accept all major credit cards. We will send you a rental agreement electronically (we use esignature) to process the rental agreement between you and the Property Owner. You have 7 days to sign the agreement to lock in the rental. Once we receive your signed rental agreement back, you will be locked in to the rental. 21 days before your rental begins, an automated e-mail will be sent to you with all the information you'll need to know about getting to your rental property, including driving directions and access information. If you don't receive the information on how to get to your property at least two weeks prior to your rental, and after you have checked your "spam" or "junk" e-mail folders - call us right away so we can resolve the issue! If there are 30 days or less until the rental start date, the entire balance in full will be due right away. If you make the reservation online less than 30 days before you arrive, your entire credit card balance will be charged immediately. 21 days or less before your rental begins, an automated e-mail will be sent to you with all the information you'll need to know about getting to your rental property, including driving directions and access information. If you don't receive the information on how to get to your property at least two weeks prior to your rental, and after you have checked your "spam" or "junk" e-mail folders - call us right away so we can resolve the issue! In order to process a rental, each Guest will need to sign a Rental Agreement that is between the Property Owner and the Guest. This Rental Agreement will be sent by e-mail with a link to the esignature contract that needs to signed within 7 days of booking the property. Deposit - 50% of the payment needs to be made within 7 days of receipt (unless there are 30 days or less until you arrive, in which 100% of the payment is due). Our rental agreements are "generic" in that we use the same rental agreement for all the properties we offer for rent. Each Property Owner that lists with us has given us a limited power of attorney to sign the rental agreement on their behalf. We believe you will find them fair and balanced to both the rights of the Guest and the Property Owners. Once you have made a booking you will have 7 days to make your initial payment. We accept Visa, MasterCard, American Express, and Discover. 50% of the total rent, taxes and fees is due to reserve your chosen property. The remaining balance is due at least 30 days prior to arrival date. Last minute reservations (less than 30 days before arrival) require payment-in-full at time of booking. In the event your check is returned for any reason, a $35 returned check fee will apply, and the reservation will be voided until satisfactory payment has been received. While you are not required to pay the rental fees by credit card, you will need to agree to provide credit card information (debit card okay) as a guarantee for negligent damages to the property. You will also need to agree to pay all rent and/or outstanding charges caused by any purchased cable charges (on demand/pay per view), or damage beyond normal wear and tear (that was unreported or over $1,000) during the term of the Rental Agreement. This is an administrative cost associated with your vacation rental. These fees vary widely across the country, we have chosen to be on the much lower end of the cost spectrum. This covers renters for up to $1,000 in accidental damages to the property. This is in lieu of a traditional "security deposit" and is non-refundable. If you break something at the property accidentally during your stay, just let us know right away, we'll pay for it. If something is damaged by your neglect or lack of care, you will be charged for those incidents and repairs. Even if there are accidental damages to the property - we ask that you report the accidental damages to us right away. This prevents them from being considered as "neglectful damages", so be sure to let us know right away of any issues. If we find damage after checkout that was unreported it will NOT be covered by the damage waiver and your credit card on file will be charged. While we look out for the interest of our Guests when it comes to rentals - we must also pay special attention to our Property Owners, who are also our Customers. Many of our Property Owners depend on the income generated by renting their vacation properties, and when a week is canceled, they must contend with lost revenue and the possibility of the unexpected situation of a property not re-renting for the week they had intended to see rented by a Guest. 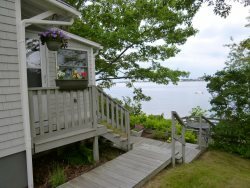 Maine has a short rental season, and every bit of revenue counts towards our owners paying property taxes, maintenance, and upkeep for their properties. Once a reservation is confirmed (i.e. rental agreement signed) any cancellations, changes of dates or switching of properties will invoke the cancellation policy. So, be sure when you proceed with initiating a rental transaction with us that you are committed to the rental. ~ If we are able to re-rent your rental dates you will receive a full refund less the booking fee. ~ If we are unable to re-rent your dates you will receive half (1/2) of the weekly rental rate. ~ If we are unable to re-rent your dates you will not receive a refund. You can purchase Travel Insurance to cover your vacation to Maine. You can choose CSA travel insurance when booking through our website or over the phone. If you wish to have traveler’s insurance, it must be done prior to making your final payment. Any CSA insurance questions need to be directed towards the CSA company and not through our office as we cannot act as their representatives. Click on the link above to get more information or to file a claim.